Located in the heart of idyllic Winchcombe is this beautifully renovated 18th century cottage, sleeps up to seven guests, in four bedrooms one of which is a private annex. Thanks to its many skylights and windows, light sweeps through the cottage to create a bright and inspiring space. Already charmed by its picturesque exterior, the three-storey cottage will continue to delight as you enter inside. The traditional home has been carefully refurbished to create a perfect mix of old and new. Lady Ashcombe has personally selected works of art and furniture to bring the history and character of the cottage to life. Some of the contents came directly from the Castles’ collection, others from local antique shops and auction rooms. The hub of the home is the downstairs living space; with an inglenook fireplace and wood burner, cosy dining room, well-equipped kitchen and stunning sitting room with a smart TV, offering plenty of space for relaxing with views into the garden. The whole downstairs flows effortlessly through to the sun-trap courtyard garden, perfect for a BBQ after walking the Cotswolds Way! The Quintessential Vineyard Street guides you all the way to the entrance of the majestic Sudeley Castle & Gardens. The only thing I could fault is the number for the lockbox that holds the key was changed and we were not informed. Which delayed our ability to get access. After trying several numbers we finally got hold of someone who could help. We were a party of 7 adults staying for my husband's 70th birthday and were delighted with the way in which the cottage has been renovated to a very high standard. The lighting was good and it was lovely and warm on a chilly March weekend. Beds are comfortable and the furnishings are all excellent. There was plenty of space for all of us, and we enjoyed the 50-inch TV. It was also a nice touch to have the welcome pack containing tea, coffee, sugar, milk and jams. 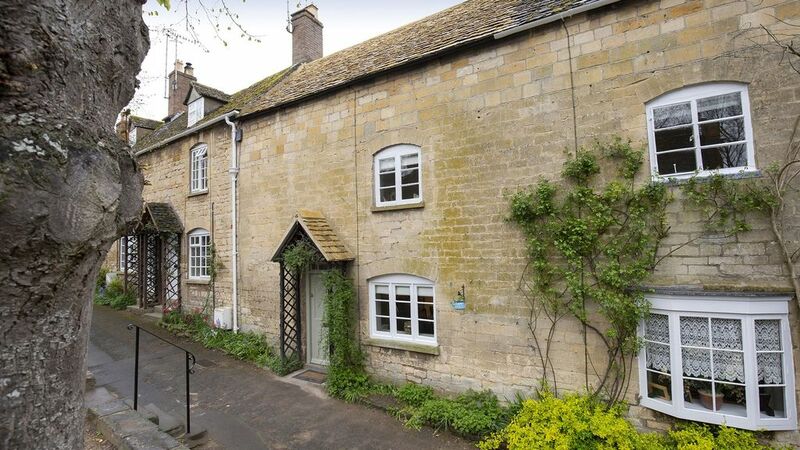 Location is great with country walks on the doorstep as well as being just a short walk to Sudeley Castle which we much enjoyed, with such a lot to see there, and the cottage is only a couple of minutes walk to the shops and amenities of Winchcombe. As a small suggestion, we felt that a couple of packs of cards would be good, and we couldn't find a glass water jug for the table or salad servers. We also felt that some more everyday cutlery would have been useful and a few more matching wine glasses. Another suggestion would be a hand rail up one side of the steps leading to the upper part of the garden and the annexe, as this was where the older members of our party slept, rather than the younger ones, and a rail would have been helpful. The dishwasher and washer/dryer were great, and it was a very good idea to have a couple of torches near the front door. It was also very welcoming to see the vases of daffodils when we arrived. We had a lovely family celebration and everyone commented on the attractiveness of the cottage. The cottage at Vinyard Steet was delightful, located close to the village amenities and yet right next to the Cotswolds Way footpath made it ideal. The staff at the Castle were lovely as well as the maintenance team who came out to sort out our heating as soon as we called. We loved Winchcombe, it had a good range of shops, cafes, and pubs and is in a good location for exploring the Cotswolds. We stayed in mid February, a large family group, and absolutely loved the cottage and it’s location! It’s literally around the corner from the village of Winchcombe, and a minute walk to the nearest pub. You’re also at the doorstep of Cotswold Way and numerous other gorgeous trails and hikes, as well as Sudely Castle. Of all the beautiful towns and villages we visited in the Cotswolds, Winchcombe was our favorite. The cottage itself is very spacious and comfortable, with lots of bedrooms, bathrooms, and seating in the main living room and dining room. The location is really quiet, yet on the cusp of activity. And we really appreciated having a washer/dryer to do laundry. Staff were very easy to contact, and in fact showed up immediately when we were having trouble with a bedroom light. Our only complaint may be related to the neighbors...there was a slight smell of cigarette smoke upstairs, and since this is a non-smoking unit we weren’t sure if it was coming through from the neighbors, or if someone had broken the rules and smoked prior to our arrival. The smell wasn’t bad, but I mention it in case anyone is allergic to smoke. Regardless, we really loved this cottage and couldn’t believe how adorably cute and comfortable it was! We can’t wait to come back, and highly recommend it to others! Fantastic facilities, even toiletries provided! We found the heating hard to figure out but got it in the end! We were able to park with no problems too. We even did the provided jigsaw. It was such a nice touch to leave us tea, coffee, hot chocolate, biscuits and milk- you thought of everything! Bathrooms and whole cottage was scrupulously clean. One last thing- please communicate the key safe code better- we were given the wrong one and were just lucky to get there during business hours so that we could call and get the right code. Other than that, a flawless stay, we all had a great time in a wonderful cottage. Thank you for all of the thought that has gone in to this charming property. You have gone above and beyond!